On the Morning of Thursday, April 18th, a small sinkhole was reported at the intersection of Hampton Road and LaSalle Avenue. The City barricaded the area and started investigating the cause of the sinkhole. 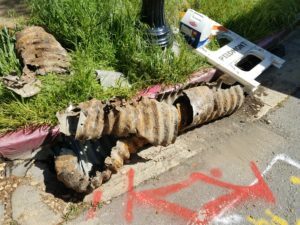 Crews determined that a twelve inch storm sewer pipe, running from a catch basin to the storm drain main in the middle of the street, made of corrugated metal, had rusted out. The deterioration of this pipe allowed water to flow beneath the pavement and undermine the roadway. The intersection of Hampton Rd. and La Salle Ave. has many underground utilities, including electric, gas, water, telephone, cable, storm sewer, and sanitary sewer. We worked with our utility partners to locate and mark the location of their underground facilities. Beginning Friday morning, City contracted crews began excavating the site. Due to the number of utilities in the area, a great deal of hand excavation was required. 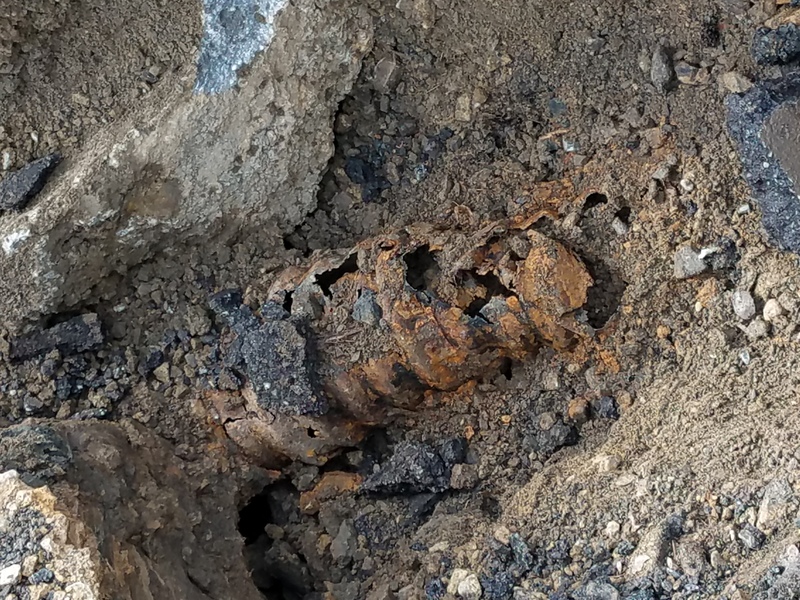 The deteriorated pipe, which is approximately fifty years old, was fully excavated and replaced with plastic pipe, which is the standard today. Though the City is 80% complete in modernizing its sanitary sewer system, this incident shows the next underground challenge which will be faced upon completion of that project. The condition of this pipe is indicative of the work the City will need to undertake with its storm sewer system. Steel plates will be placed over the section to accommodate weekend traffic. Work will continue into the week of April 22nd. Traffic should be able to flow through the intersection around the work, but residents traveling through the area are asked to proceed with caution and exercise care. Residents with questions can call the Public Works Department at (510) 420-3050 during normal business hours. At the April 3, 2019 Piedmont Park Commission meeting­, Nancy Scott from the Piedmont Garden Club and Chairperson of their Civic Projects program, presented Mayor Bob McBain and Park Commission Chairperson Betsy Goodman with a generous donation of $5,000 to be used towards installing new light strings in the courtyard of the Piedmont Community Hall in Main Park. The City is in the process of upgrading the electrical controls for the exterior pole lights at the Community Hall. When Phase 1 of the lighting improvements is completed, the City will start Phase 2 and will be working with lighting consultant Thomas Skradski of Lumen Works and the Electrical Contractor, Mark Schulkamp of Mark W. Schulkamp Electric Co. to design and install new light strings that will be suspended from the four pole lights in the courtyard. The pole lights will be designed to accommodate the new string lights. Once the new string lights are installed, the courtyard illumination will offer an option with the new, festive string lights. The Piedmont Garden Club on April 18th, arranged for members and friends to deadhead the hundreds of daffodils in Blair Park. 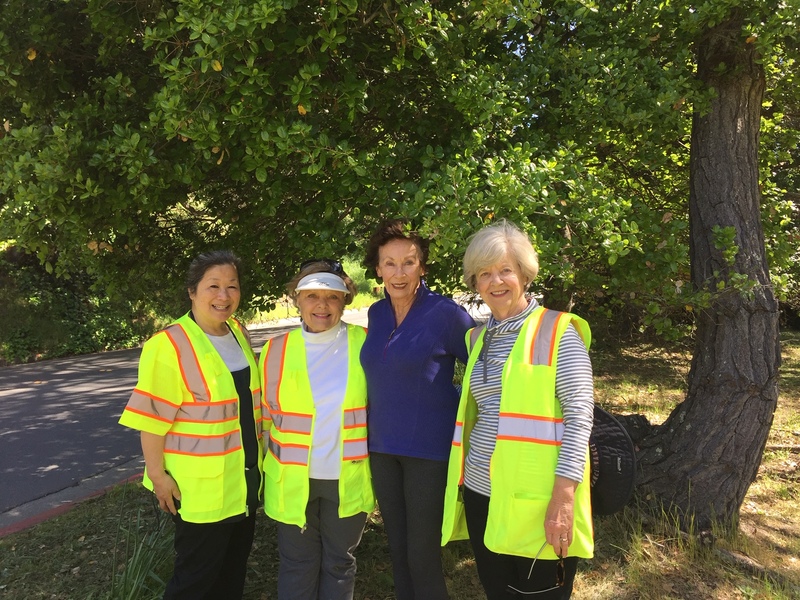 From left to right: Sharon Hom, Mary Wood, Sandy Hagglund and Nancy Scott. 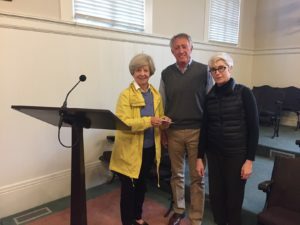 The Piedmont Garden Club https://www.piedmontgardenclub.org/ has a long history of contributing their time and generous donations to the City of Piedmont. CIP Review Committee Agenda Tuesday, April 23, 2019 7:00 p.m. The meeting will not be recorded or broadcast. The public is welcome to attend and participate. City/School Liaison Committee to Discuss Tobacco Grant Funding Possibly for a School Resource Officer or Other Purposes. Monday, April. 22nd – 4:00 – 5 p.m. open to the public in the Piedmont Unified School District Offices, 760 Magnolia Avenue. The Piedmont Unified School District and City of Piedmont will hold a meeting of the City/School Liaison Committee to discuss the California Department of Justice Tobacco Grant Award on Monday, April 22nd at 4:00 p.m. in the PUSD offices located at 760 Magnolia Avenue. Liaisons are appointees chosen from the City Council and School Board. The discussions at this meeting will center on how Tobacco Grant funds might be used by the City and PUSD to bolster and/or develop tobacco mitigation efforts and additional health education programs focused on prevention for tobacco related issues and other student health efforts. This conversation is an outgrowth of previous discussions between PUSD, the City, and the community on the initial proposal to establish a School Resource Officer. The City/School Liaison Committee is not a decision making body, rather it focuses on discussions of issues of mutual interest between the two agencies. The influential discussions are expected to be reported to their elected bodies for potential action and/or information. This meeting is open to the public. It will not be publicly broadcast or recorded. Our Piedmont community will soon be asked to renew the School Support Tax that funds roughly 25% of the Piedmont Unified School District’s (PUSD) budget. Because the State does not adequately fund education, the School Support Tax is critical to maintaining the excellence of Piedmont schools. The current School Support Tax (Measure A), approved by the community in 2013, taxes each taxable parcel the same amount. In recent letters, Mr. Rick Schiller advocates what he terms a “progressive tax” to replace Measure A. Mr. Schiller proposes that the next tax: (1) apply a uniform tax rate to the square feet of buildings on a taxable parcel, rather than a uniform amount to each taxable parcel, thus shifting more of the cost of schools to owners of large homes; (2) impose a lower rate on unimproved lots; (3) include an “income based senior exemption”; and (4) continue to include “compassionate SSI and SSDI exemptions,” which exempt property owners below certain poverty levels. I must start with the litigation risk (excuse the detail), which could impose unaffordable costs on PUSD and potentially leave our schools unfunded. Piedmont’s School Support Tax is a “qualified special tax” authorized by California Government Code § 50079, which provides such a tax “means special taxes that apply uniformly to all taxpayers or all real property within the school district, except that unimproved property may be taxed at a lower rate than improved property.” (Emphasis added). In Borikas v. Alameda Unified School District, 214 Cal.App.4th 135 (2013), the Court invalidated Alameda’s school parcel tax (Measure H), which taxed residential and commercial properties, and commercial properties above and below 2000 square feet, differently. The plaintiffs argued that Section 50079 “means all taxpayers and all real property must be treated the same, and school districts are not empowered to treat different kinds of taxpayers, and different kinds of real property, differently.” Id. at 147. The Court agreed, holding that Section 50079 “does not empower school districts to classify taxpayers and property, and impose different tax rates.” Id. at 151. The Court found it could “sever” the invalid parts of Measure H, and upheld a parcel tax of $120 per parcel. Id. at 166-67. Mr. Schiller, and others before him, have argued that Borikas does not bar a tax under Section 50079 based on a uniform rate per square foot (either of land or buildings). Borikas did not expressly rule on such a tax. However, Borikas found it must follow Section 50079’s text, and the text refers to “special taxes that apply uniformly to all taxpayers or all real property.” It does not refer to a uniform rate, but to a tax that applies uniformly. The tax imposed on small vs. large parcels/homes would be different under a “per square foot” tax. Further, looking to Section 50079’s legislative history, Borikas rejected Alameda’s claim that it would be unfair for “all parcels [to] bear the same tax, regardless of size,” noting: “The Legislature was aware, however, that uniform parcel taxes were considered ‘more inequitable’ than ad valorem property taxes because all parcels, regardless of size, are subject to the same tax. … Nevertheless, the Legislature made no adjustments or provisions in this regard.” Id. at 158 (emphasis added); accord id. at fn. 27. Nothing since Borikas has removed the risk that a Piedmont “per square foot” tax under Section 50079 will be ruled invalid. In 2014, SB 1021 was introduced in the California Legislature to amend Section 50079 to expressly authorize a “per square foot” tax—it did not pass. In 2018, the Legislature adopted AB 2954, which amended Section 50079 to allow school districts to tax unimproved property “at a lower rate than improved property,” but did not authorize a “per square foot” tax. While the reference to a “rate” rather than an “amount,” provides an argument that uniformity refers to “rate” also, there is no ruling on point. Mr. Schiller notes that the Alameda Superior Court has twice upheld Alameda School District’s later parcel taxes, which impose a “per square foot” taxes. However, the Alameda Superior Court also upheld Measure H, and the lawsuits against Alameda’s later taxes were settled before the First District Court of Appeals, which issued Borikas, ruled on appeal. Mr. Schiller also relies on Dondlinger v. Los Angeles County Regional Park, No. B284932 (2019), but that case addressed Pub. Resources Code § 5566, a different statute, which expressly states that a park district may establish a “rate” which “is to be applied uniformly.” Further, Dondlinger is a Second District decision; Piedmont is in the First District, which is governed by the Borikas decision. Until the First District Court of Appeals or the California Supreme Court upholds a “per square foot” school parcel tax, or the Legislature amends Section 50079 to expressly allow such a tax, I do not think it is prudent for PUSD to take the litigation risk of asking Piedmonters to approve such a tax. Litigation could cost $100,00 to $500,000, depending upon motions, trial and appeals. PUSD does not have that to spare. Moreover, to feel secure in spending the tax revenue, PUSD would have to file a validation action, but that simply ensures any litigation starts quickly. While it is possible that no Piedmont property owner would challenge such a tax, there is no way to remove the risk. (Note that Alameda’s parcel taxes have been challenged three times). PUSD could not spend the tax revenue until any litigation is resolved, as PUSD would have no way to pay back the taxes collected if the tax ultimately were held invalid. Further, because PUSD cannot fund its school budget without a parcel tax, if the tax was challenged, PUSD would have to run another parcel tax election immediately, at additional significant expense. Under Mr. Schiller’s proposal, PUSD (and every Piedmont family with school children) would take this risk so that owners of small homes could pay less than owners of large homes. There are times when accepting litigation risk is necessary. This is not one of them. I also believe that the School Support Tax must be fair to Piedmont residents. The Piedmont schools benefit every resident. For nearly everyone, our children have gone, are going, or will go to school. Piedmont residents have shared the cost of public education no matter where they are in this cycle. Moreover, the excellence of the Piedmont schools is why Piedmont homes are so valuable. Further, an available and excellent public education is fundamental to civil society, and we all have a civic duty to ensure it. Asking the owner of each taxable parcel to pay the same amount seems fair to me. I include unimproved parcels as the Piedmont schools make those parcels valuable. A “progressive” tax generally is perceived as taxing wealthy people more by increasing the tax rate at higher levels of wealth or income, and is supported by the notion that those who have more money can afford to pay more tax toward community needs. In claiming his proposed tax is “progressive,” Mr. Schiller equates a building’s “square feet” as equivalent to wealth or income, and assumes that owners with more “square feet” can afford to pay more. That may be true in some cases, but certainly not all. Square feet alone does not establish the value of a home (consider age, quality or location). Owning a large home does not establish wealth other than the home itself (it may have been bought long ago) or a ready ability to pay higher taxes (a young family may have stretched to buy a home with sufficient bedrooms, or a retiree bought a large home years ago). I also do not support an “income-based senior exemption.” Age does not determine whether a homeowner has a ready ability to pay the School Support Tax. Nor is current income a true measure of wealth or ability to pay. Moreover, per the last census, roughly 20% of Piedmont residents were over 65. Assuming roughly 20% of homeowners also are over 65 (it could be higher), exempting any significant number would either underfund the schools or impose a significant burden on the remaining taxpayers. Further, under Proposition 13, those of us who have owned a home here longer (and are usually older) pay less property tax than young families who have bought a home more recently. PUSD’s existing income-based SSI and SSDI exemptions (see Section 50079(b)) provide relief to those who are truly in severe financial distress, regardless of their age. That seems an appropriate balance between a homeowner’s ability to pay and the needs of the community. I support the current Measure A structure—each taxable parcel paying the same amount to support our schools, with narrow exemptions for those truly in financial distress. Donated food to taste plus information ! On Wednesday, April 24th from 7:00 p.m. to 9:00 p.m., the City of Piedmont and Piedmont Connect will host “Tasting a Sustainable Future: Piedmont Climate Action Fair & Reception” at the Piedmont Community Hall. Consumption is a large portion of emissions that are emitted in Piedmont. It is hard to measure and to monitor as emissions stemming from consumption are based on individuals’ choices. The April 24th event will showcase different sectors of consumption: transportation, food, water, home energy, clothes, and waste. Residents who come to the event will have the opportunity to learn how to purchase more sustainably, reduce their food waste, conserve water, travel greener, and electrify their homes. Information at the event will be provided by representatives of the East Bay Municipal Utility District (EBMUD), East Bay Community Energy (EBCE), Bay Area Air Quality Management District (BAAQMD), and StopWaste. Members of Piedmont’s community and City staff will also be sharing resources and information. Attendees will have a chance to meet Piedmont chef Paul Arenstam of Summer Kitchen and San Francisco chef Nick Balla of Bar Tartine, who will serve sustainable snacks from Balla’s new Smokebread project. They will also be able to try Patagonia Provision’s new Long Root Wit beer made with the climate-friendly grain, kernza. Registration will close once the event reaches capacity. The City appreciates your understanding. For more information about this workshop or to be added to the climate action email list, please contact Assistant Planner Mira Hahn at mhahn@piedmont.ca.gov or Climate Fellow Brooke Edell at bedell@piedmont.ca.gov, or by calling (510) 420-3050. The Piedmont Police monitored surveillance cameras program will be considered by the Council for adoption in June, 2019. To understand the issues involved, see the frequently asked questions, important dates for public meetings and the police department’s existing Public Safety Camera Policy > here. The Police Department is partnering with the Public Safety Committee to aid with public outreach on this important topic. No decision of whether to approve the Public Safety Camera Program has been made. The City of Piedmont, Piedmont Police Department and Public Safety Committee thanks you for your time and interest. Click to read the City of Piedmont’s Public Safety Camera Frequently Asked Questions document. Community members with question about the proposal are encouraged to contact Police Chief Jeremy Bowers at jbowers@piedmont.ca.gov or via telephone at (510) 420-3010. Reducing Traffic Speed on Oakland Avenue, Magnolia, and Fairview Avenues with Bulb-Outs, bright flashing Beacons, Bioswales and relocated Crosswalks. The city consultant, Coastland, prepared preliminary designs for proposed bulb-outs and other changes at several intersections on Oakland Avenue plus other streets. The consultants will discuss their concepts at the Piedmont City Council meeting on Monday evening, April 15, 2019, in City Hall, 7:30 p.m. The meeting will be broadcast live on Channel 27 and from the City website under videos/City Council. See links to staff reports showing locations and photos at the end of this article. Before proceeding to the final designs and construction documents, the City wants to ensure that the Council and the community have full awareness of the proposed improvements and have an opportunity to have any questions or concerns addressed. Oakland Ave. at Jerome Ave. While very similar in features to the Oakland Ave. at El Cerrito Ave. bulb outs, the Jerome Ave improvements will have a slightly different configuration due to the intersection geometry. Grand Ave. at Fairview Ave. In the Piedmont Pedestrian and Bicycle Master Plan (PBMP), this intersection was identified as No. 8 in the High Priority Projects. The basic issues related to this intersection are that it is a very wide crossing for pedestrians, and motorists traveling northbound on Grand Ave. and wanting to turn slightly right to proceed up Fairview Ave. are difficult for pedestrians to see. See staff report Exhibit C for photographs of the existing intersection. Furthermore, because of the ease of this slight right turn and the uphill nature of Fairview Ave., there is a tendency to accelerate through the intersection. The configuration was driven by creating traffic calming and increase pedestrian safety, but also preserving the existing street parking. Thus, the use of street paint still allows parking in front of 1250 Grand Ave., which fronts on Fairview Ave. See staff report Exhibit D for the proposed configuration of improvements. Magnolia Ave. at Nova Drive Previously identified in the PBMP as No. 17 in the High Priority Projects, this intersection poses issues for pedestrians, especially when walking on the northern side of the street (left side going uphill). Along Magnolia Ave. at the intersection with Nova Drive, the throat of the intersection is extremely wide. See attached Exhibit F for a photograph of the existing intersection. Since the 2018 Paving Project includes this portion of Magnolia Ave, Staff wants to take the opportunity to implement the recommendations of PBMP and install logical measures to create traffic calming and a safer environment for pedestrians. The proposal is to create an island refuge with street paint, lane delineators, and signage. This would be connected to the existing sidewalks with new crosswalks of considerably shorter length. Besides creating an island refuge for pedestrians, this will visually narrow the westbound lane of Magnolia Ave. which should promote slower speeds.